I attended the Blue Jays’ home opener on Monday, running my streak to 39-for-39 in franchise history. (Even when they were rained out in 1980, I skipped my last class to attend the 4 pm first game two days later.) Of all the books I’ve worked on, my favorite would be when we did the Toronto Blue Jays Official 25th Anniversary Commemorative Book at Dan Diamond & Associates. It’s hard to believe it was so long ago. Our book came out about the same time that HBO released 61*, which was directed by Billy Crystal. He talked a lot about what a thrill it was for him to tell this story of his childhood heroes. Well, Billy Crystal got to worship Mickey Mantle, and Roger Maris, and Whitey Ford when he was a kid … but I’ve been watching for the ENTIRE HISTORY of the team I cheer for. Still, for this story, I’m borrowing from Billy’s team … though from a lot earlier than he remembers. Recently, I came across Mark Truelove’s web site candiancolour.ca which displays digitally colourized historical Canadian photographs. It’s AMAZING. My only criticism is there aren’t enough pictures! (I imagine that’s because it takes time for him to do them so well.) The picture below is one of two on Mark’s site featuring Babe Ruth, and it got me wondering what he was doing on stage at the Pantages Theater in Vancouver on November 29, 1926. Chief of Police Long as umpire. For a larger image, see Mark’s web site. For another original shot of Ruth on stage, see the Vancouver Archives. Babe Ruth had had a terrible season by his standards in 1925. That was the year of “The Bellyache Heard ’Round the World” when he arrived at spring training horribly overweight and eventually spent several weeks in hospital with a stomach ailment that has never really been explained. Back in shape for 1926, Ruth rebounded to hit .372 with 47 homers and 146 RBIs. The Yankees won the American League pennant in 1926, but Ruth made the final out in game seven of the World Series against St. Louis when he was caught trying to steal second base. At the time, this actually seemed to increase his popularity! 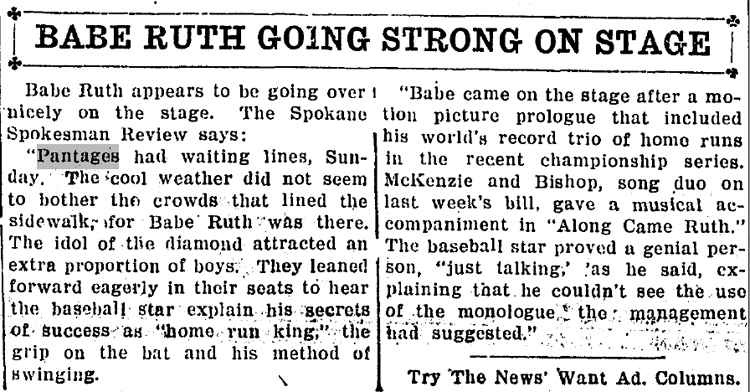 (Ruth also hit four home runs in the series, including three in game four alone, when he may or may not have promised to hit one for hospitalized 11-year-old Johnny Sylvester, which didn’t hurt his popularity either!) 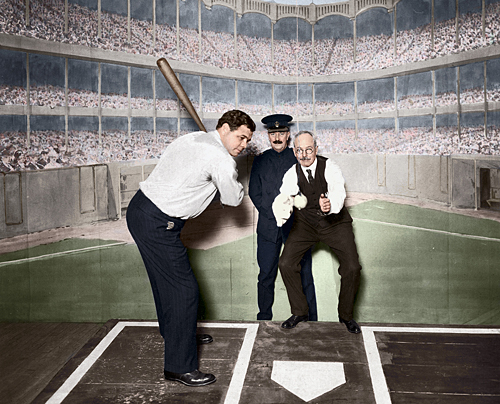 After the series, Ruth went on a short barnstorming baseball tour before hitting the western vaudeville circuit. “Mr. Dunn made a pitcher out of me,” Babe Ruth relayed to his hungry audience. He was baseball’s best left-hander early in his career, and that started with the minor-league Baltimore Orioles under the watchful eye of manager Jack Dunn. Towards the end of the tour, Ruth was arrested in San Diego on January 23 because it was said that by calling up boys on stage with him so that he could sign autographs he had violated California’s Child Labor Laws! Regardless, kids stormed the stage in Long Beach the following night, and Ruth was later acquitted of the charges. 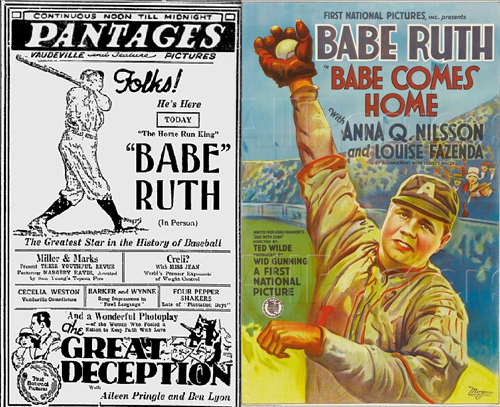 Before leaving California, Ruth lingered a little longer to film the movie Babe Comes Home, in which he plays a ballplayer whose love of a woman is threatened by his addiction to chewing tobacco. Soon after filming, Ruth signed his new contract with the Yankees, and though he got off to a slow start in 1927, he went on to hit .356 with 60 home runs and 164 RBIs (Lou Gehrig hit .373 / 47 / 175 and was named MVP) as the “Murders Row” team went 110-44 en route to winning the World Series. Fascinating! Too bad no one’s ever made a GOOD movie about Babe Ruth. . . I agree there should be a movie made about Babe Ruth…he had quite a life!!! I did not know he had done Vaudville or about the arrest…imagine the children only wanted his autograph! Good thing the charge was dropped. He REALLY is a legend in the baseball world!! Thanks for a fascinating read Eric.